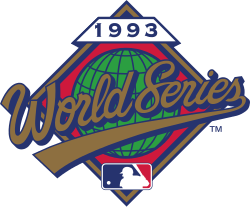 The 1993 World Series was a best-of-seven playoff series to determine the champion of Major League Baseball for the 1993 season. It pitted the defending champions Toronto Blue Jays of the American League against the National League champions Philadelphia Phillies. With Toronto ahead three games to two in the Series, but trailing Game 6 by a score of 6-5 with one out in the bottom of the ninth inning, with runners on first and second base and a count of two balls and two strikes, Joe Carter hit a game-winning three-run home run to win Game 6 by a score of 8-6 and the series four-games-to-two for Toronto, its second consecutive championship (the first repeaters since the 1977–78 Yankees). This was only the second Series concluded by such a home run (the first was in the 1960 World Series on a Bill Mazeroski home run for the Pittsburgh Pirates), and the first such occasion where a come-from-behind walk-off home run won a World Series. Both teams would experience long absences from the postseason; the Phillies did not return to the postseason until 2007, or appear in another World Series until their championship season of 2008, bringing the city of Philadelphia its first championship since the 76ers swept the 1983 NBA Finals. The general manager of the Blue Jays, Pat Gillick, was general manager of the Phillies team that won the 2008 World Series. The Blue Jays did not qualify for the playoffs again until the 2015 season. Fastball is hit to left field, down the line, in the corner, home run! Joe Carter who took the 2 and 0 pitch for a strike right down the middle hits the 2 and 1 (sic) pitch over the left field wall and the Toronto Blue Jays come back with 3 in the bottom of the ninth inning to become the World Champions yet again. The final score Toronto 8 Philadelphia 6. ↑ "1993 World Series Game 1 – Philadelphia Phillies vs. Toronto Blue Jays". Retrosheet. Retrieved September 13, 2009. ↑ "1993 World Series Game 2 – Philadelphia Phillies vs. Toronto Blue Jays". Retrosheet. Retrieved September 13, 2009. ↑ "1993 World Series Game 3 – Toronto Blue Jays vs. Philadelphia Phillies". Retrosheet. Retrieved September 13, 2009. 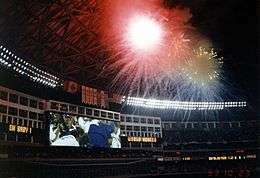 ↑ "1993 World Series Game 4 – Toronto Blue Jays vs. Philadelphia Phillies". Retrosheet. Retrieved September 13, 2009. ↑ "1993 World Series Game 5 – Toronto Blue Jays vs. Philadelphia Phillies". Retrosheet. Retrieved September 13, 2009. ↑ "1993 World Series Game 6 – Philadelphia Phillies vs. Toronto Blue Jays". Retrosheet. Retrieved September 13, 2009. ↑ Sheridan, Phil (October 30, 2008). "WORLD CHAMPS!—28 years later, Phillies again are baseball's best". Philadelphia Inquirer. p. A1. Retrieved March 20, 2011.